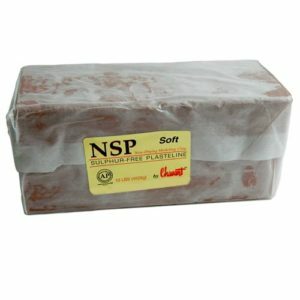 Made sulfur-free, Chavant's NSP Plasteline is soft in consistency and does not dry out. Used extensively in the Fine Arts and Special Effects arenas, this sculpting clay can be melted and poured at approximately 185º F.
Color: Brown. Packaged Case/5 10-lb. units/50 lbs. Chavant's Professional Plasteline is a non-drying modeling clay, equally perfect for the professional sculptor as well as all school levels. Ready to use, this modeling clay is soft, smooth, permanently pliable, reusable and requires no heating. Its consistent high quality is attributable to Chavant's original formula and manufacturing process. With all the advantages of a non-sulfur, wax-based plasteline, but not the cost, Jolly King Plasteline has a smoother, more uniform texture that professional and amateur sculptors favor. 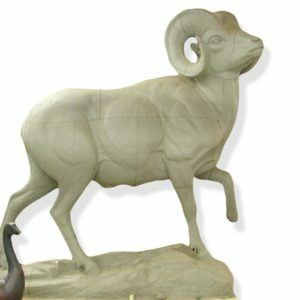 Because it has no sulfur, a wider range of mold making and casting materials will be found to be compatible. 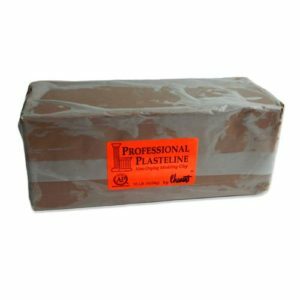 Pliable, non-toxic, and non-hardening, this sculpting plasteline is an unrivaled value. Color: Grey-Green. Packaged Case/1-lb. units/48 lbs. An economical, sulfur-free modeling clay, Jolly King Plasteline provides all the benefits of more costly modeling materials. Its wax-base provides a smooth, more uniform texture preferred by professional sculptors. The absence of sulfur ensures compatibility with a variety of mold making materials. Pliable, non-toxic, non-hardening, Jolly King Plasteline is the perfect choice. Color: Grey-Green. Unit Size: Packaged Case/5-lb. units/50 lbs. Also sold in individual 5-lb. units.